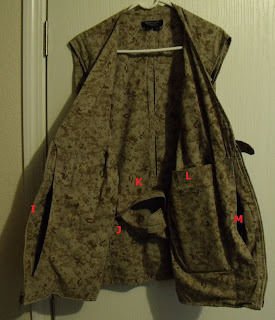 This is my version of a survival vest, which can augment a bug-out bag if needed. You don't have to go to this extreme, but for me its a piece of mind when I'm away from home. You may have your own idea of what a survival vest should consist of and that's great. At least you are thinking and hopefully putting together your own type of vest or kit. It is better to have something than nothing. 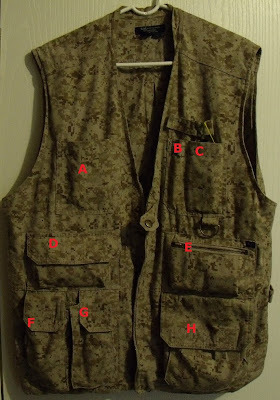 Each pocket of the vest is labeled with a letter. 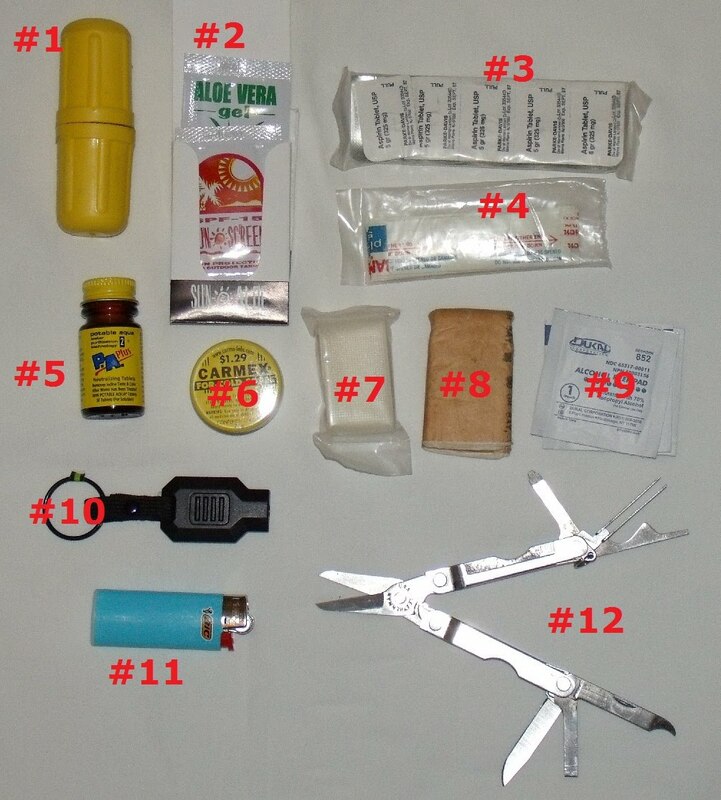 Below is a list of what I carry in those pockets. The vest weighs about 23 lbs. depending on season. 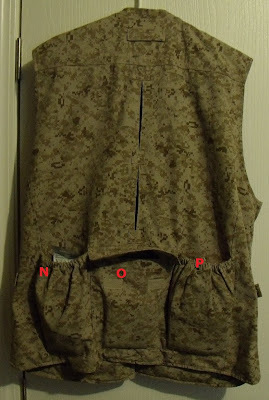 The vest was sprayed with a water proofing spray used for canvas tents and outdoor clothing. 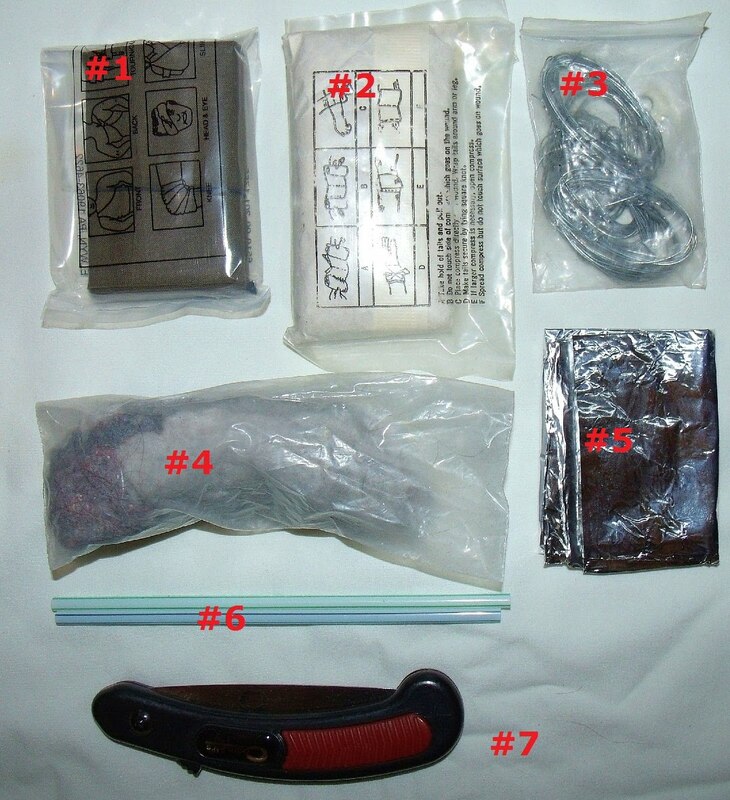 #5- Back up pocket knife with assorted add-ons. #7- Pencil wrapped with 3 feet of electrical tape. 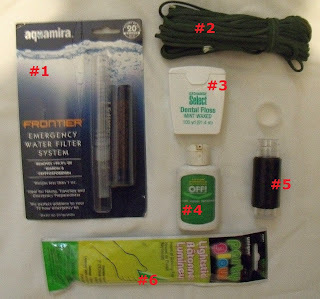 #1- Survival fishing kit: hooks, line and sinkers. 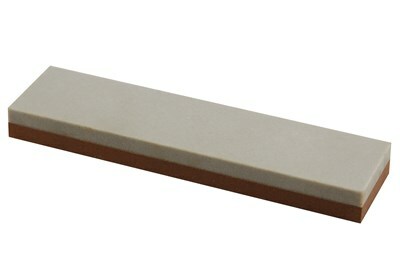 #2- Spare knife sharpening stone. 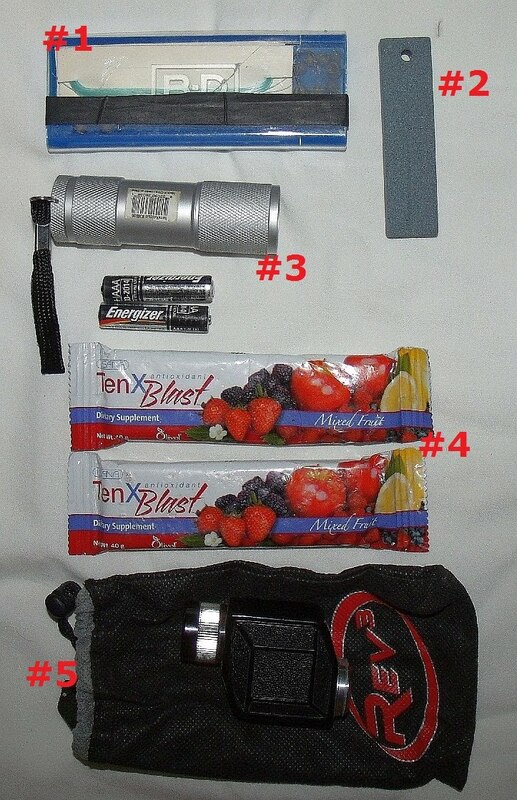 #3- Mini flashlight (diode bulb type) with spare batteries. #4- 2 each fruit energy bars (Ten X- Blast). #6- Cell phone (not shown). #1- Tri-bandage arm sling. 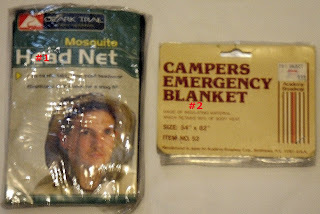 Can also be used as a pirate type head gear like I wear in my videos and when I'm out and about in the wilderness. #2- Compressed bandage with attached gauge. #3- Snares made from snare wire 6 each. #4- Baggie containing dryer lint for fire starting. 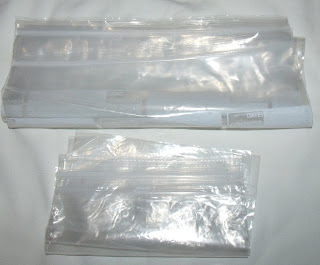 #6- 2 each drinking straws with 2 inches cut off to fit pockets. 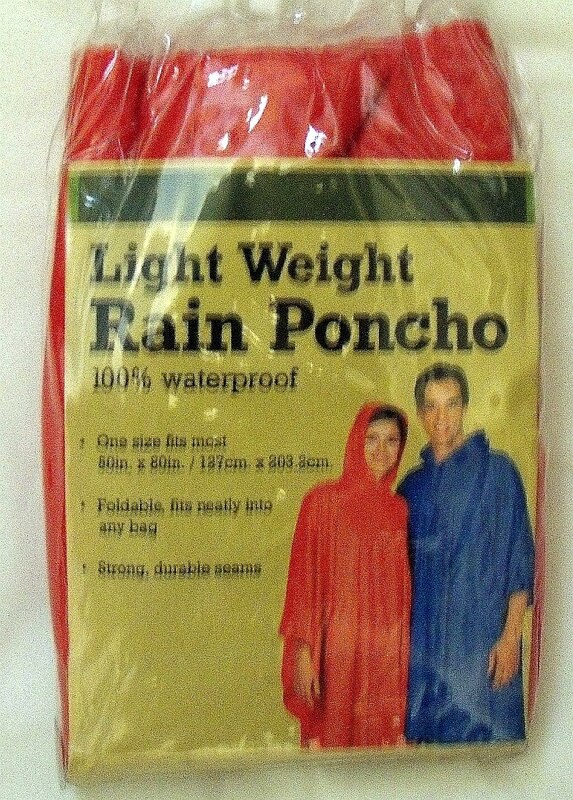 1 Each light weight rain poncho. 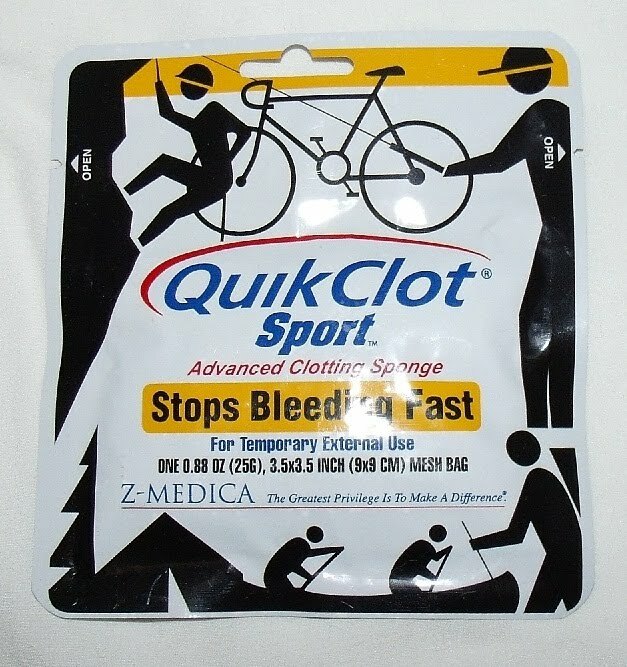 1 each QuikClot sport pak. 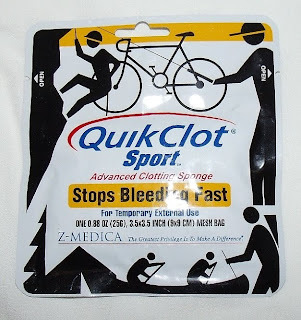 Used for serious bleeding. 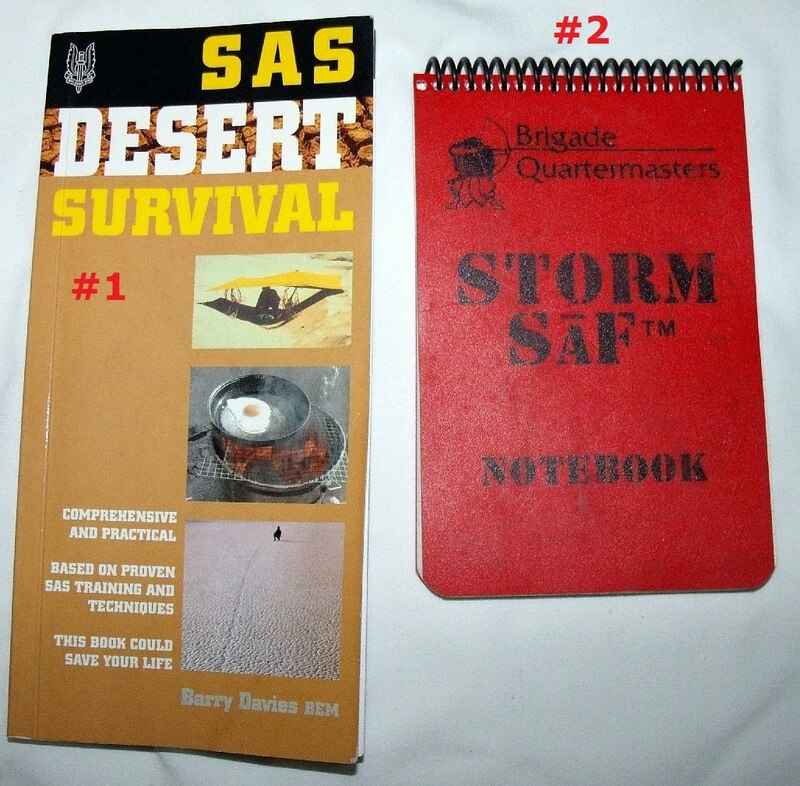 #1- SAS Desert survival handbook. #2- Water proof notebook for taking notes, leaving notes, etc. 2 Each one gallon clear plastic baggies; 3 each one quart clear plastic baggies. 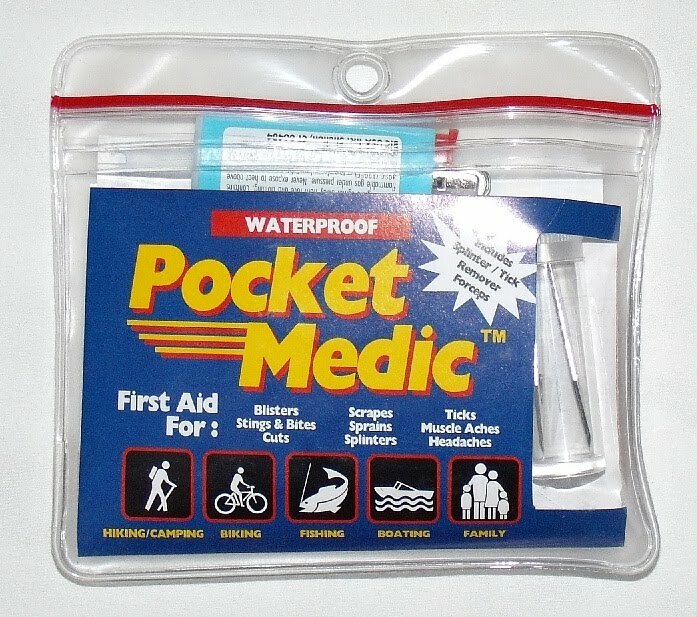 (can be used to store water or food or for what ever needs to stored. #1- Aquamaria portable water filter straw. This product with clean 20 gallons of water. #2- 50 feet of 550 para-chord. #3- Dental floss, waxed. 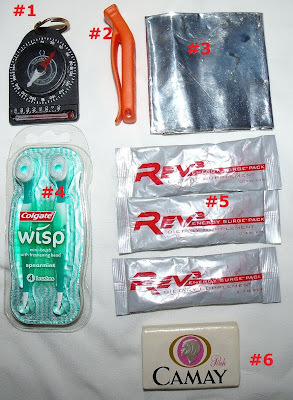 Good for cleaning your teeth, cordage, and for tying feathers and arrow tips for making arrows. 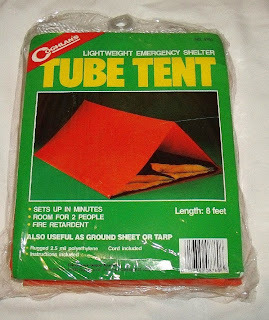 #5- Clear plastic tube with lid and 3 feet of rolled duct tape. The clear tube can be used to store extra medication, char cloth, cotton balls cover in Vaseline for fire starting, needle and thread, etc. #6- Glow in the dark chem-lite, green in color, 6 hours of usable light. 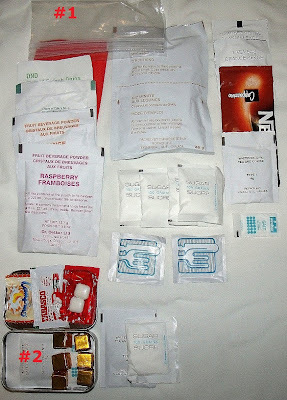 #1- 1 quart sandwich baggie containing: 1 packet chicken soup; 1 packet French onion soup; 1 packet cream of celery soup; 1 packet orange powder drink; 1 packet raspberry powder drink; 1 packet instant vegetable rice; 2 tea bags; 1 instant coffee packet; 1 creamer packet; 1 salt packet; 4 sugar packets; 2 wet napkin packets. 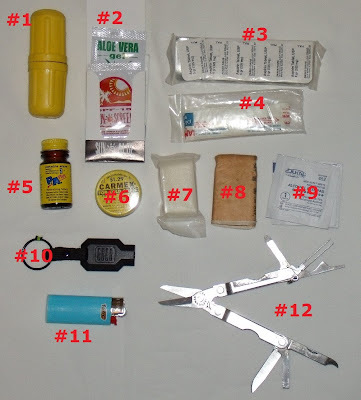 #2- 1 mint tin containing: 6 chicken bullion cubes; 2 salt packets; 1 sugar packet; 1 creamer packet; 1 instant coffee packet; 1 packet Tabasco sauce; 1 hard candy; 1 packet gum. The M6 Scout Survival Rifle is no longer manufactured. You might get lucky and find one at a gun show or pawn shop. This rifle is a .22 cal, .410 cal over and under barrel configuration. 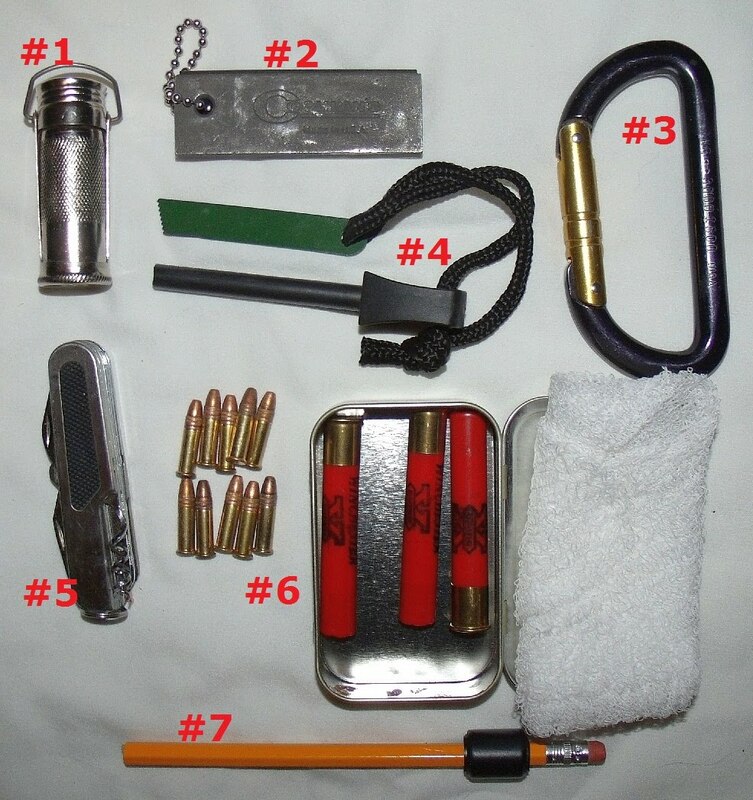 Its has a magazine that carries (15) .22 cal ammo and (4) .410 cal ammo. Its folds in half and fits perfect in my bug-out bag or hiking backpack. This is my survival knife of choice. 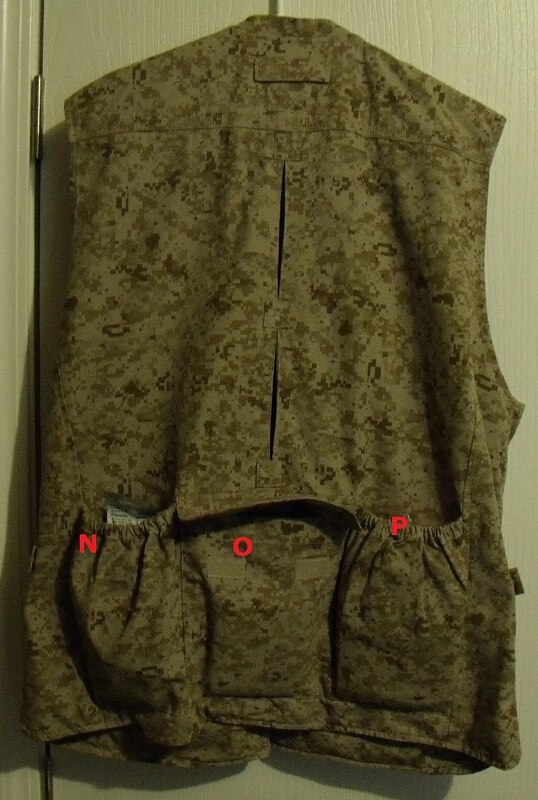 Its stays with my vest as a companion item and is worn on my belt or attached to the vest when in storage. The blade is Titanium .440 steel. Its is very durable, keeps a good edge and fits well in my hand. The sheath is well built with a diamond studded sharpener attached. At a minimum I carry a multi-tool on my belt and a small pocket knife in my pocket. 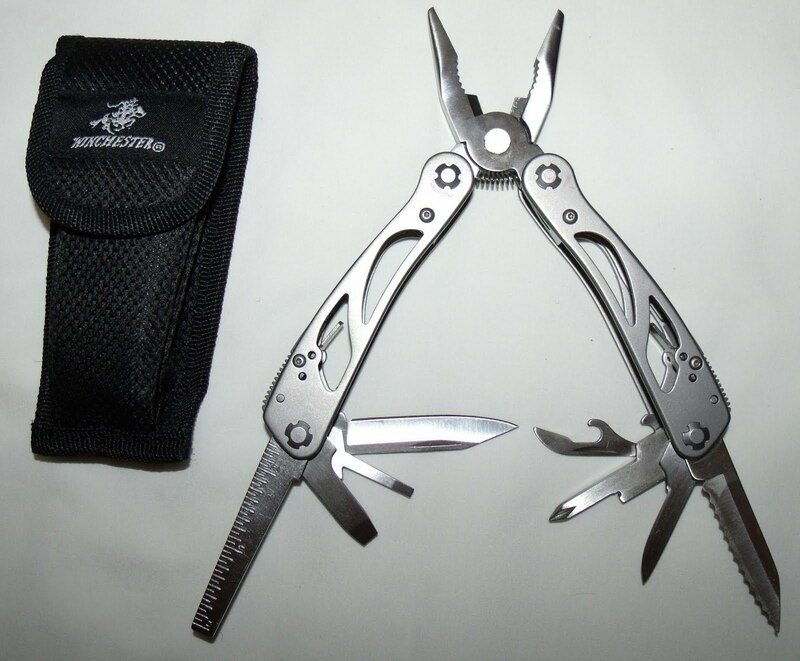 I am partial to Winchester and Leatherman multi-tools because they a very sturdy and have not failed me yet. Some other items to add would be an extra pair of reading glasses if you are not able to see without them. They should be stored in a crush proof case. Great EDC vest. Can't really have something like that where I live. Well, I suppose you could, but you would stand out like a sore thumb. In my backpack, I carry much of what you do and it sometimes hits that 15 - 20lb range depending on the situation... Good stuff though. Look forward to more of your videos and your blog. EXCELLENT! This is the best example of a survival vest I've seen, very comprehensive. GREAT VEST! VERY WELL THOUGHT OUT! Suggestions: A) Put the small compass and micro-light on the zipper,using a heavier gauge ring, and the carabiner too, to free up space in pockets D,F, and E. B) AMK's Thermal Bivy would replace the tube tent (It lasts longer and works better, I have tried both in 30-40 degree weather and much prefer the bivy!) 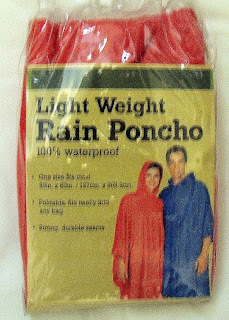 C)The lightweight rain poncho in pocket I can be replaced with a 2-pc. emergency set sold in most Walmart stores that weighs the same and provides basically a second set of clothes too. D) The bar of soap in pocket D can be replaced or augmented with a travel sized hand sanitizer gel bottle. The alcohol-based gel is a great backup fire starter too. Lastly I would sew some elastic straps to each shoulder, 1.5-2" thick with an opening about 3" wide. Take the paracord from pocket N and ranger braid it, you can wear it from one, hanging on the carabiner there. On the other, it's a space to tuck an ENO single hammock, to get you up off the ground, away from snakes, etc. I am looking into other lightweight hammocks made from paracord that can double as fishnets/bags too. You do GREAT STUFF man, keep it up!!! More great ideas to add. Thanks for the post and thanks for visiting my site. Awesome info! Do you publish a newsletter? 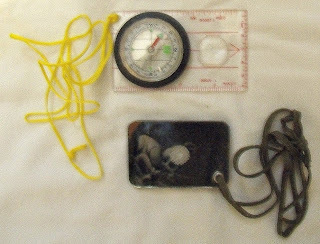 I am a 100% disabled US Army Vietnam Vet and would sure like to get on your email list if possible. My email is: mhylton54@yahoo.com (Mike "Sarge" Hylton) Thanks a lot and keep up the Great Work! I don't have a newsletter, but when I do, I will add you. Thanks for the kind comments and for visiting my site. I too am a disabled Army Vet. Thanks for helping us protect this Country. This may have been stated somewhere, but which vest is this, or did you sew it yourself? It looks like it'd be very handy for me, with a few small changes of items.